While in Devon Christine began to write more widely. Short stories and plays were intermittently successful, with a few sales professionally. A stage play, White Magic, was performed by the local amateur players to considerable acclaim in December 1962. Arthur then got the opportunity of a job with the BBC, as a Schools Radio Producer. He jumped at it, and the family, now increased by the appearance of their second son, Peter, in 1963, moved to London. They lived in Dulwich for the next twenty years. David started at the local infants’ school. By the time he reached the primary school, it was clear that he too had trouble reading and writing. The headmaster, apologetically, told Christine and Arthur that David was a lovely little boy, but rather backward. Both parents had no doubts as to David’s intelligence, and insisted on a more careful assessment. David returned from school one lunchtime saying he had had a lovely time playing games that morning with a different lady. The next day the school contacted them to say that the educational psychologist had confirmed that David had a significant IQ. In a report in one of the newspapers of the time, Christine came across reference to dyslexia; word-blindness. In the mid sixties, this was an entirely new concept; Christine recognised her own experiences, and could see what David was suffering. Christine always said that she wished she had known at David’s age what had been affecting her; she was also, in later years, very proud to show what a person with dyslexia could achieve. Upon visiting her home town of Macclesfield in the early 60s, she realised that much of the silk industry in the town was vanishing. She became interested in the vanishing art of hand block printing, and spent some time researching the techniques of constructing the blocks and using them. She presented a paper to the prestigious Newcomen Society on the subject in February 1969. While on holiday with the two children, the family visited a working windmill. This was an event that was to change Christine’s future. When they got home, one of the children began playing with a toy windmill their grandfather had made. Christine wanted to find a book about windmills for the children, but could not find a single one. Christine therefore decided to write one. Needless to say, it was rejected by a number of publishers, but one, A&C Black, invited her to visit to discuss the project. A&C Black only published series of books, not individual titles; Christine found herself, in 1968, with a contract to write a series of four volumes on Industrial Archaeology. For the next three years, the books were the core of what she was doing. Six books were eventually published by A&C Black – Cast Iron, Windmills and Watermills, Crossing the River, Roads, Canals and Railways. Each featured photographs by Arthur of many of the subjects, usually with one or other of her sons in the frame to give a sense of scale and to help the readers identify with the subjects. They were a great success, selling widely and being positively reviewed. The final pair now featured Richard, her youngest son. At around the same time Christine became involved with the Inner London Education Authority, which was just starting a TV service. She was a researcher for ILEA TV for some years, writing a dozen scripts for TV programmes, as well as writing a directory of museums and other resources for London schools. She also delivered a number of lectures on the subject. With the A&C Black series selling well, Christine was asked in 1973 to write a guide for young people to the new Ironbridge Gorge Museum that was just opening. She produced a leaflet giving a clear picture of the sprawling area which sold extremely well – in the end, after some years, it was dropped from production because it was having too great an impact on the sales of the main guide! In the late ‘70s, Christine and Arthur were heavily involved in a major exhibition on industrial archaeology at the Horniman Museum in London. Christine also wrote further books on the subject for Faber and Cambridge University Press, the latter ending up being sold in a slightly different version in the United States as well. The couple also wrote a package for schools on wheat and bread-making. In 1985 Arthur retired from the BBC, and the couple decided to move out of London. The three boys were all leaving home and scattering, so Arthur and Christine decided to move to Leicestershire, to be relatively central and thus not too distant from any of the boys. They picked the village of Kibworth, and moved into 25 Gladstone Street. The house was in poor shape, and they spent some time doing it up. Tragically, just as the work was finished, Arthur suffered a heart attack and died. Christine was devastated, but after a little while she rallied and determined to carry on. She had become interested in genealogy in the seventies, and now decided to focus upon this. Family had always been important to her. She had worked assisting others in researching their family histories, and had also made good progress in tracing her and her husband’s families back. She was well aware that the family had links with Northamptonshire, and started visiting the Record Office there. Whilst looking for records on the Vialls family, she came across records of a Births, Marriages and Deaths tax imposed in 1695. The records were a goldmine for genealogists, but there was no index of the entries, making it virtually impossible to search for names. She decided that the job needed doing, and for some years visited the RO regularly to generate the index. In the process she got to know the archivists, and she learned that there were boxes of papers that a firm of solicitors in Daventry had lodged with the Record Office some years before, and that no one really knew what they contained. Intrigued, Christine offered to assist in archiving them. Many of the records related to Poor Law cases from the early 19th century. The more Christine studied the papers, the clearer it was that this was an extraordinary primary source of historical information. Christine delved into the documents, and eventually decided to write a paper about the Poor Law. 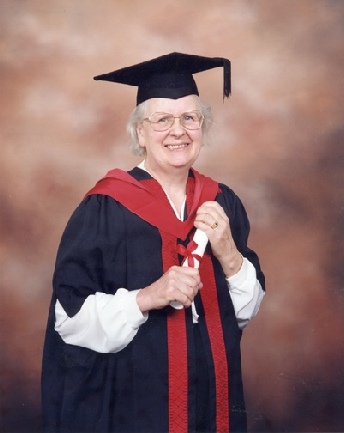 She was a member of the Leicestershire & Rutland Family History Society, and she realised that this was the opportunity for her to get a formal degree; something she had always thought was never an option for her. She talked to the University of Leicester, and ended up spending six years producing a doctorate thesis on the Poor Law. The girl who had left school with only a limited grasp of written language became Doctor Vialls in 1999, at the age of 74. Her last published book again came from the Northampton Records Office, where she traced a manuscript diary of a Reverend John Mastin. Her interest initially was because Mastin was one of her ancestors, but upon examining the document it became clear that here was a detailed picture of the work of a country parson. She and a friend, Kay Collins, turned the handwritten manuscript into a book, with a wealth of commentary and background, together with Mastin’s account of the Battle of Naseby. The book was published in 2004. Her interest in family history led to her founding the Kibworth History Society in 1989. Originally, the meetings were in her front room, but as the Society blossomed it outgrew its first home. Christine was a member of the Congregational Chapel in Kibworth and had a great interest in the history of the Congregational movement in England. She had the sad duty of assisting in the closure and sale of the Kibworth Chapel in 1997 and started writing a history of the Chapel. The Kibworth & District Chronicle commissioned Christine in 2000 to organise the compiling of a new history of Kibworth, a work that was started but is yet incomplete. She was heavily involved in the exhibition within the village dealing with the village history in 2003, and was working on the village book when she became ill; sadly preventing her becoming involved in the Michael Wood TV series. She died peacefully in Kibworth Knoll on 2nd December 2010 leaving three sons and four grandchildren, with a fifth grandchild due in April 2011. Dr Christine Vialls was the Founder and Life President of Kibworth History Society and a successful writer with a dozen books to her name. She was born in Macclesfield in 1925, daughter of a cotton merchant, with two sisters. The depression in the thirties did not aid the family business, and by the war her family were in relatively straitened circumstances. Christine did not do well at Macclesfield High School for Girls; she struggled to learn to read and write, and was branded lazy and stupid. It would be more than twenty years before she would first hear the word dyslexia. Her early ambitions revolved around music. She originally learned the piano, which led to her starting at the Royal Manchester College of Music aged 17. She qualified after three years and began working as a piano teacher. After a time, she realised that she had a potential future as a singer. She was taught by Elizabeth Schumann, a very famous soprano of the day, and was expected to have a good career as a professional singer, giving various concerts and recitals in the next few years. At this stage, to support herself, she started writing, despite her constant struggles with such niceties as spelling. Initially she wrote music notes and criticism for a number of the local papers. Instead of continuing with her career in music, though, she met a man named Arthur Vialls. They fell in love and married in 1955, and they moved to Devon where Arthur was employed as a teacher. Three years later they were expecting their first child, and Christine decided that she could not carry on with her singing career and look after a baby. David, her eldest son, was born in January 1959.